So we're just over a quarter of the way through the season. We've won 10 of our last 14 games and sit just 5 points shy off of the top of the table but yet we're struggling to breathe, let alone smell confidence at the moment. Our performances have reflected much of our thoughts this year in what has started to look like a far greater transitional season than the one we felt we'd be victims of last year. Fake smiles at 1-0 victories, manufactured laughing and joking far more out of relief than delight. We've lost the that touch of flair and dynamism. We traded £100m worth of talent for another £100m worth of talent and in all honesty we're a left with a mix of hope and anxiety. We finally didn't see ourselves in the envious shoes watching on as squads - not teams - destroyed competitions and lifting silverware. It was hard not to succumb into a dream world where Tottenham Hotspur are up there with the best, it was a struggle to hold back writing endless pieces of satire about how it all ended happily ever after. But this wasn't the pragmatic viewpoint. This was theory. Theory is something that would generate far more success on FM than in real life. Unfortunately. What we found ourselves left with was a system that generated an initially unbalanced side. The emergence of Andros Townsend on the right and injuries to Nacer Chadli left us short of an immediate option out left and the natural width that we'd grown so used to. We had quality, but it needed time to settle in - they needed to find their feet and their place in the side. We've grown to become a more expectant fan base. Mix that in with a pot of a £100m+ squad in front of you and the results can be deadly. Last years' consistent performers found themselves fighting off the fringes. One has found himself shoulder to shoulder with the youth (or out in Siberia). Either a lack of pass and move or a sincere lacklustre attempt at pass and move left us almost unsurprisingly leaving with a sense of misdirection. Was it still a settling in period or are we simply not clicking as we felt we would? Soldado. I'm still a little lost for words. He hasn't had the service we'd have expected him to get but at the same time he's finding himself marked out of games far too easily. He looks far too leightweight up front and almost seems to have underestimated the physicality of the Premier League. 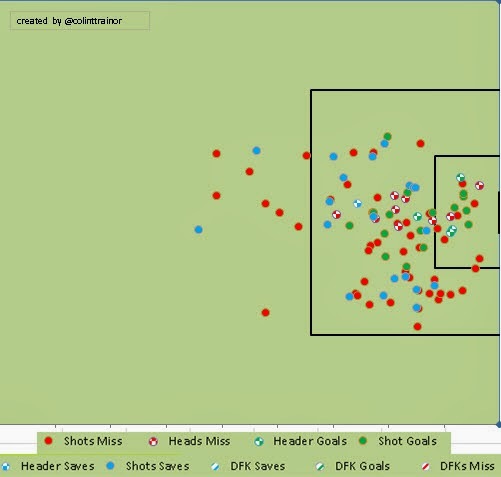 Soldado's average shot accuracy stands at just 55%. 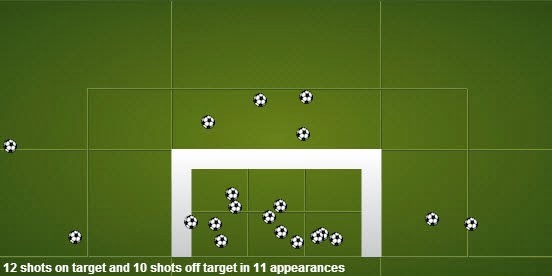 His shots have been few and far between, averaging just 2.3 shots per game. This isn't too considerably less than his final season in Valencia in which he averaged 2.9 shots per game. The issue is that Paulinho and Townsend both have 3.3 and 4.5 shots respectively each - but have scored just twice in 81 shots between them. This arguably hinders the opportunities given to our number 9 as our midfielders aren't picking him out. Is it worrying that Rebrov had 5 goals in his first 11 league games? I don't think we can dive to deep into that. With just 12 key passes and 2 assists as well as an average of 0.3 dribbles per game so far, it's arguable to say that Soldado isn't the creative forward that can engineer chances for himself or others and so relies on the service around him. One key issue is we took around 50% of our shots from outside the box from last year (albeit due to the mesmerising attributes of Gareth Bale) and it would always take a more pragmatic approach on the training ground to actually adapt and bed in a team of new players and a new system to fit in a £26m poacher. Soldado's final season in Valencia saw him have exactly 100 shots in the league and a conversion rate of 24% - most of which were inside the penalty area. 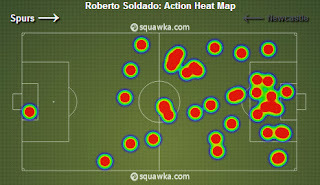 With two inverted wingers, Soldado lacks the natural width he'd thrive off of to pounce on whipped balls into the centre. Our second issue is that with Townsend preferring to cut inside and shoot, Soldado lacks further service coming from central areas. Soldado's heat map vs. Newcastle is shown left. It's evident that the forward continued to come deep to try and get involved with play as he became more isolated staying on the shoulder of the last defender. Soldado's a poacher but he's having very little in which to poach. A change of system may resolve this. 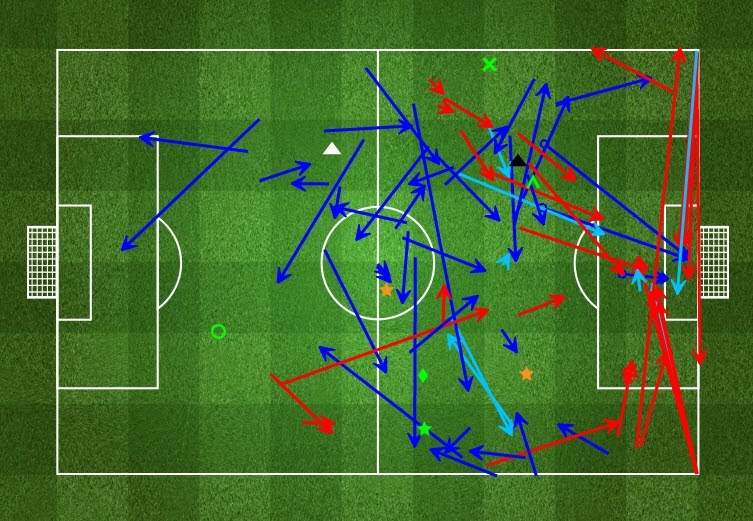 Shifting Townsend out wide and encouraging him to stick more balls into the box - as he did so well away vs. Tbilisi - would increase the likely attempts on goal and the chance of conversion. But shifting Townsend isn't the only answer.We'd have probably expected more of Soldado but the service provided has been exceptionally poor - and this points us to our next man. Cristian Eriksen. It raises more than one eyebrow to recognise this guy is just 21 years of age, not due to the ever recinding hairline, but because of the expectation and reliability the guy seems to weight himself down with whenever he takes to the field. His lack of starts (just 7 in all competitions) has prohibited him to find his rhythm and forge a partnership with Soldado in the squad. This has to be our man to unleash our number 9. Engage them, marry them, send them away on a training camp to Dubai together - I don't care - just get the two playing in the same side. Statsbomb highlights brilliantly that Eriksen actually engineered 9 key passes v Newcastle which has notably only happened 15 times across this year and last year out of a whopping 1800 matches across the big 5 leagues in Europe. This is quite significant. A player that was slated for his performance achieved something that has happened in around 0.0083% of games spanning last year and the start of this year. I feel our main issue is that we don't get the ball at Eriksen's feet high enough up the pitch for any real impact. It's evident that for a player operating just off the shoulder of a lone striker, he's evidently having to come deeper to pick up the ball and play a pass as shown. His heat map also shows an honest story with much of his influence being pulled out left or into the centre midfield role. This arguably could've been as a result of Paulinho pressing so high and leaving the midfield a player short. According to FFT Statzone, Eriksen created 4 chances from open play but notably 3 of the 4 chances created were on the fringes on the final third and unsurprisingly lead to little damage. This guy was brought in to feed our £26m forward. With 41 assists in 113 matches at Ajax and still being at the ripe age of just 21, it's obvious we've an immense talent within our ranks. A quicker transition between the defensive players/midfielders to Eriksen into the final third will only allow for an environment in which he can engineer goal scoring opportunities. Let others do the tracking back and keep him off of the shoulder of Soldado. That partnership has the making for something quite beautiful. Time is also a beautiful thing, so let's keep our heads grounded and give him the patience than a 21 year old attacking midfielder quite probably needs. Let's leave Eriksen and Soldado to be our vocal point in attack. I do find it a little ironic that one of our most influential players last year in Mousa Dembele has struggled to infultrait his presence amongst the new side and his influence has been noticeably absent. Although I don't pin this on the player losing his ability over a summer, but put it down to the new role he's finding himself locked down in. He's far more restricted this season, I've almost gauged the impression he's been told not to cross half way on a number of occasions and is forced to act as the anchor in our side. 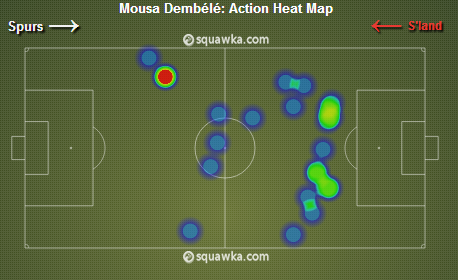 If this is the case then we've sacrificed both an efficient and effective use of Dembele. He's not a midfielder that sits, he's one that breaks up play and drives from midfield, easing past players and picking out a pass. His pace and stamina allowed a flurry of counting attacking moves last year and it's quite possible that this slight change in our new system this year has isolated Mousa from his most effective place in the side. 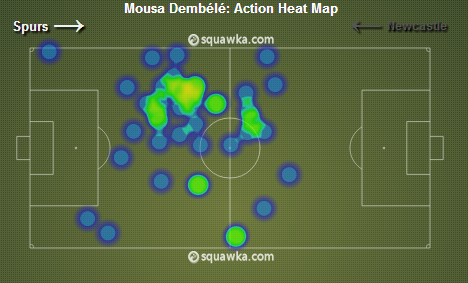 Dembele's heat map vs. Sunderland (our final game of last season) is shown on the left and his heat map vs. Newcastle is shown on the right. Although this represents just two games spanning last season and this one thus far, it's evident that we're restricting ourselves the opportunity to get the best out of Mousa. The question remains that within this system, if the Belgian is proving ineffective then arguably moving Holtby into this role may work more effectively for the team. I do feel a little guilty at the suggestion of dropping Dembele after his fantastic performances last year, although I can't see him jumping straight back into the side in the long run unless if he is given license to drive from midfield as he did so well for us last year. With Dembele and Paulinho initially offering more bite than creativity in midfield, a lot of our flair was reborn through the unearthing of Andros Townsend, who seemed to pick up where he left off at QPR and showed a lot of confidence starting in the Premier League for Spurs. In all honesty, I'd always been a fan of Townsend. For me if a winger can beat a player and put in a decent cross then they're half way to becoming a substantial figure in the side. The once irreplaceable Aaron Lennon has found his opportunities more limited this season (granted he's suffered injury for much of the season) but his absence from the team is proving the burden that it once was. We may have the real possibility on our hands of having a fully fit Aaron Lennon come the end of the season which would prove invaluable. This is something that I keep in hope. After Andros' initial impact in the side, he's arguably come under more scrutiny than he likely ever has done in a Spurs shirt. My frustrations are derived from we lose the effectiveness of Roberto Soldado when Townsend cuts inside and favours a shot. His average shot accuracy is at just 52% and his inability to play (not pick) a pass is proving detrimental to the side. I say this because, interestingly, Andros has created the most chances in the Spurs side with 19. Kyle Walker (17) and Cristian Eriksen (15) are the two behind him. With Townsend being naturally left footed, it's understandable that he prefers to cut in and shoot than try and pick a cross. He's evidently been given license to do this from AVB and as a result his cross accuracy this season has been a rather abysmal 20.4% in the Premier League this season. Shifting Townsend out left would see him receive the ball on his more favoured left foot and grant a stronger possibility of him whipping in a cross instead of cutting inside and shooting. This would leave a spot open on the right hand side of midfield and this is where Erik Lamela steps in and tries to recreate the fantastic form he showed for Roma last season out there. Although Lamela is left footed as well, he's had a far stronger experience in the past playing out wide right and seems to prefer to pick a pass than to shoot when inside. This would also mean we're playing with two wingers and give us more balance in the side. Lamela's last outing was a far more confident and thorough performance than in the past and it's clear the Argentine is slowly finding his feet in the side. Although, with Eriksen now set to be out injured for around 4 weeks, this does offer us the possibility to bringing Lamela into that number 10 spot and recalling Aaron Lennon out wide. This would naturally see us play with more flair and give us some good options on the counter-attack, something greatly needed away at City. Lamela needs integrating into this side and seems to grow in confidence the more times he takes to the field. Although City won't be the most ideal team in which to start his first Premier League game against, he will have the benefit of playing without the pressure and expectation he'd arguably have playing at home against a side in which we're favourites to win. Leave the industrial work to the centre midfielders sitting behind him and allow him to flourish in a free role off of the shoulder of Roberto Soldado. One other name that needs to be starting more or less every Premier League game is Sandro. I think we as fans do well to not underestimate his ability to break up play and start off our counter attacking. He arguably operates in a similar role to Paulinho but does it in deeper positions then sits - he's not a natural box to box midfielder. 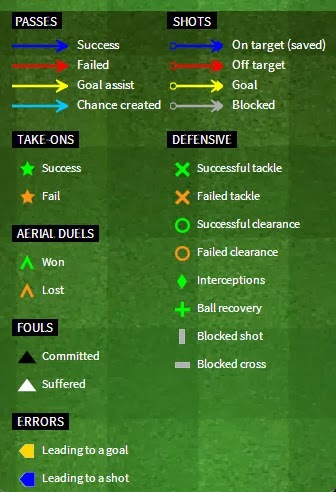 Paulinho hasn't proven to be as effective as he was at the start of the season and although I think Sandro and Paulinho can play as a partnership (and arguably against City this may be the best option), overall, we need a more naturally creative outlet to sit in and begin moves - just as Luka Modric did so well. 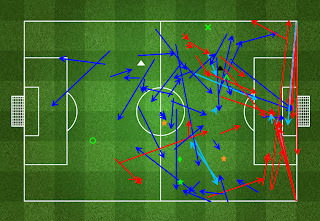 This is where Holtby steps up and plays in his favoured role in centre midfield. The German's looked far more effective and efficient this year and channelled his energy into being more intelligent with his passing and movement. We're seeing more of the Holtby that did so well Schalke. 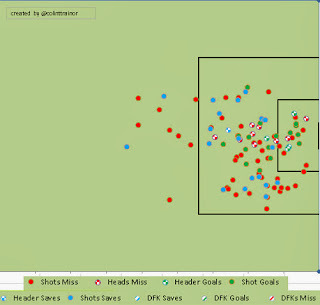 Holtby isn't creative enough to be a number 10 but, like Modric, he has an eye for a pass and begin moves. We're graced with having 4 very good diverse centre midfielders in Dembele, Paulinho, Sandro and Holtby and utilising the best of all four for the sake of the club is key. Our game should naturally adapt with whichever partnership is playing, ie, we shouldn't force Mousa to play the role that Sandro would play if the Brazilian is missing out. We need a consistent 11 in the Premier League and I'd love to take a punt on seeing Sandro and Holtby paired together or reverting back to Sandro and Dembele and giving the Belgian license to break from midfield. If Paulinho is to make an impact in our side, as I felt he did at the start of the season, then he needs to be sharper. I felt he was capable of winning the ball high up the pitch and beginning moves but his performances have been far more lacklustre as the season has worn on and his shooting has been exceptionally poor - especially for a player that thrives in a 'box-to-box' role. Contrary to what I'd read recently, 4-4-2 is not the answer. 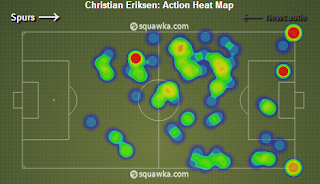 This system naturally isolates the most creative players (if they were to both be playing) in Lamela and Eriksen. They'd start too deep and be pressed higher up the field. Although, in saying that, movement between the lines needs to be better. We don't appear to be playing as a unit, we're lacking any real partnerships - albeit the squad is a relatively new one. If the defence have the ball, we should have more options to play it short - start the moves deeper if we have to. We shouldn't be forced to go long. With these numbers we should play to get the ball into the final third as quickly as possible and one of the centre midfielders should be supporting Eriksen in trying to pick a pass - whether out wide or through the centre. Keeping the ball in the final third, being patient and encouraging an emphasis on quick passing and movement will unlock chances for Soldado and the midfield behind him. We need to be more ruthless instead of the barrel of nerves we appear to be when going forward at the moment. We've more talent in our side than Mila Kunis' thong yet we;re struggling to see it on the pitch. These aren't changes that will happen over night but are changes that need implementing. We need to get our squad playing the same game, on the same wave length and understanding one another. The Newcastle game was a big a wake up call as we needed. Let's see our response.